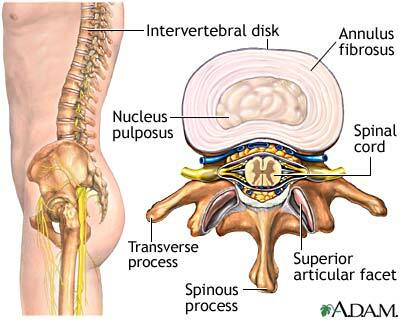 The intervertebral disc or discus intervertebralis in latin is found between two vertebrae and consist of a semifluid nucleus pulposus with an annulus fibrosus surrounding it. The nucleus consist of 70-80% water but this decreases as people get older. The annulus consist of 10-20 concentric fibrous rings, with fibers of alternating orientation. The main function of the intervertebral disc is to allow movement between two vertebrae and to transmit loads from one vertebral to the next. It should be noted that only 15% of all chronic low back pain is linked to a certain condition, the other 85% are non-specific. According to Kallewaard JW, et al. approximately 40% of all chronic low back pain is attributed to the discus intervertebralis. Although not clearly mentioned in the review, the sources that are listed, are about specific low back pain. In the US, nearly 50% of football lineman have low back pain during a normal season. 10-27% of all college football players experience some form of lumbar spinal problems.1 Non-contact sports such as golf and cycling are also linked to low back pain. Discogenic low back pain typically increases when sitting, flexing the back, coughing, sneezing. In general, activities that increase intradiscal pressure. There is no typical examination to determine discogenic pain. Some consider biphasic straightening from flexion an indication of problems with the discus. Pain from pressure on the proc. spinosus is considerd an indication for discogenic low back pain. Although these examinations give an indication, they have not been validated and additional examination is needed to determine discogenic low back pain, such as MRI and CT.
Another possible test is a lumbar overpressure test. The patient sits on the table, with his back to the therapist. The therapist pushes downwards on the patient’s shoulders. If this provokes pain, the test is considered positive. The patient can also make a rounded back to provoke the anterior part of the disc, and a hollow back to provoke the posterior part of the disc. With conflicting evidence for several treatment methods, it’s clear there is no one true treatment method and the therapist should see which kind of therapy the patient responds to best.